Are you making your Labor Day Weekend plans? Do you want to stay close to home? How about ending the summer with these awesome LOCAL events? Labor Day weekend and First Friday of the month in Fredericktown just happen to land on the same weekend…how convenient if you ask me! This will give you the perfect opportunity check out The Loft and the great community of Fredericktown, MO. The Loft is just one of the two fantastic art galleries in Madison County and they hold a First Friday of the month event every month opening their gallery up to local artist and community around them. The Loft is open from 6pm to 9pm on Friday September 2nd and the community would love you to drop in and check out their great artists. http://loftcommunityarts.org Make plans to attend this first Friday event and spend the evening in the great town of Fredericktown; you could some fantastic Cajun food for dinner at Wayno’s, or stop off at the beautiful Vance Vineyards & The Twisting V Grille …just two of the great places to dine at in Fredericktown, MO. If you are not in the mood for some rodeo fun then get your tickets now for this grand event at Homan Hall in Marquand, MO! 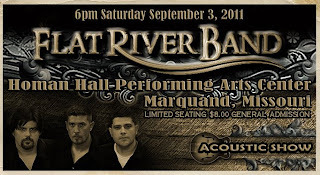 Homan Hall Performing Arts Center and the city of Marquand will be welcoming the Flat River Band on Saturday September 3, 2011. 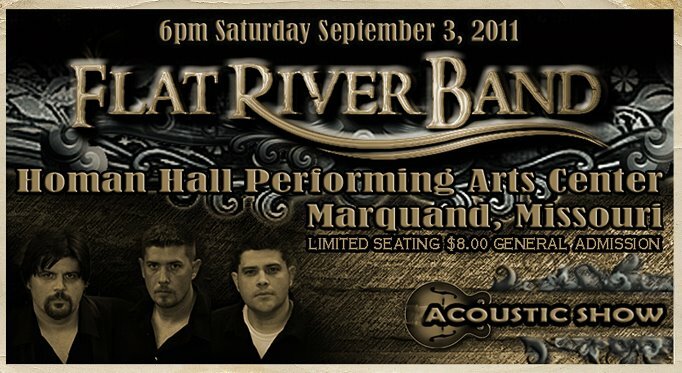 This will be one great show; the Flat River Band is an Acoustic Instrumental Band and performs all over the country. What a unique opportunity this is for us Southeast Missourians and the Great town of Marquand, MO. There is limited seating and this band has great music, so I highly suggest you call now to book your tickets 573-783-7525 or 573-783-5262. You can get a preview of this great band at their website www.flatriverband.com. 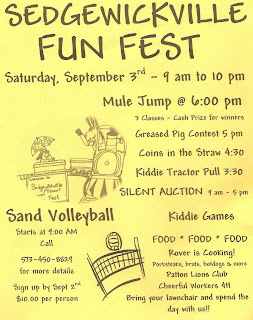 Marquand and the Flat River Band would love to entertain you for the evening; you could also head out early and check out the sights in Marquand, MO. Their lovely art gallery The Gallery will be welcoming artist Mike Phelps for the month of September. The Gallery is open 12pm to 5pm on Saturday and Sunday. Durso Hills Winery and Bistro is great place kick back and relax with your friends, spend some time with that “special” someone, or have dinner as a family. Head over to Regan Hotel Antiques located in the downstairs of Homan Hall…..try not to spend all your money in one place; I know it will be hard with all great antiques this place has! Regan Hotel Antiques is open Friday, 1:00 – 6:00, Saturday, 10:00 – 5:00, Sunday, 1:00 – 5:00. If you’re looking for some old-fashion fun and just want to spend the day with some great local folks. 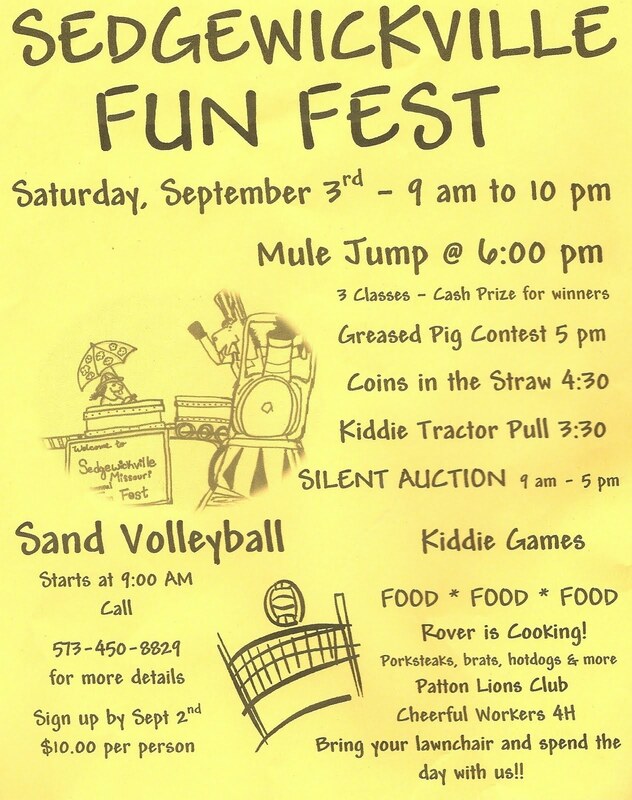 The Sedgewickville Missouri community invites you to their 9th annual Sedgewickville Fun Fest….they have fun filled day planned and would love for everybody to join them! Looking for some camping, off-roading, or just some adventurous fun? 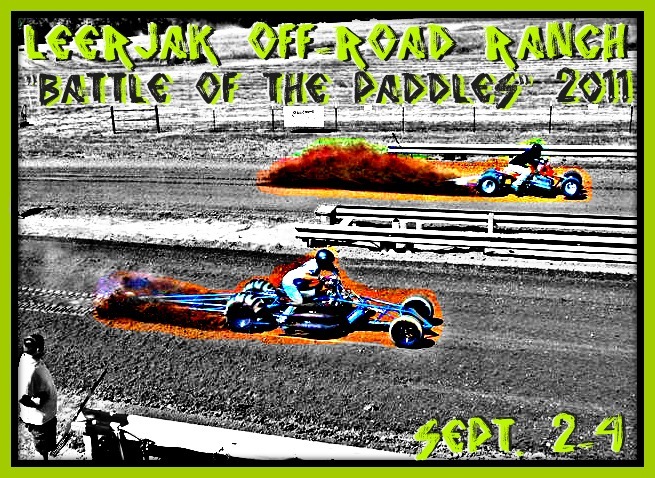 Check out LEERJAK’s “Battle of the Paddles” in Patterson, MO. 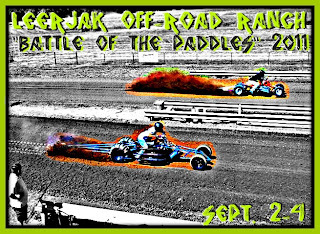 LEERJAK has all the amenities you will need for a fun filled weekend, they will have entertainment provided for you…rather you are an off roader or not, and they would love you to come out and visit! Give LEERJAK a call at 573-856-4134 or head to their website www.leerjak.com to make reservations and see more about this way too cool place! LEERJAK is just up the road from Sam A Baker State Park and Pine Hills Drive-In Theater….you can find plenty to do in their neck of the woods! If you’re feeling adventurous, you could hit all these great places and finish off summer with a BANG! All these events and places are fun, affordable, family friendly, and best of all they are LOCAL!